Picture Frames for Any Year. Your clients or customers will enjoy a gift from your company celebrating the year they were born, or the year they married their spouse with these year frames. Think of the memories you can help your customers preserve with this special gift. The year picture frames are for 3.5 x 5" pictures. each one is custom made for us by a very special frame supplier. The frame is made of alderwood, and is laser etched to say "(Your Year) is a Very Good Year.." . 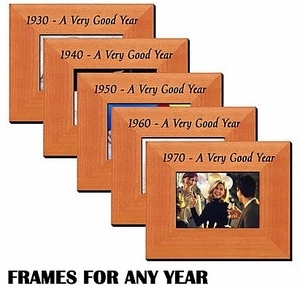 You can buy these year picture frames for any year from 1929-1981. Contact Us for a price quote.